Today I’ll start off a series of gemstone designs. Wedding anniversaries are what I had in mind when I made these elegant cut stone images. First we’ll take a look at amethyst, with its gorgeous purple hue. A faux amethyst ringed with faux gold is the centerpiece of this precious metal and damask design. 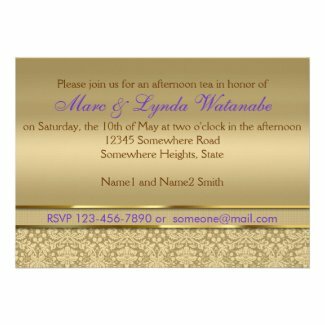 Enjoy the gorgeous gold and purple tones. 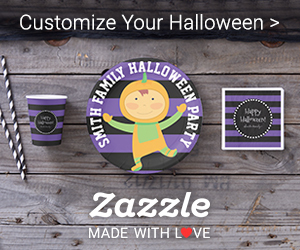 Add your names or message within the ornate text borders for a personalized item. 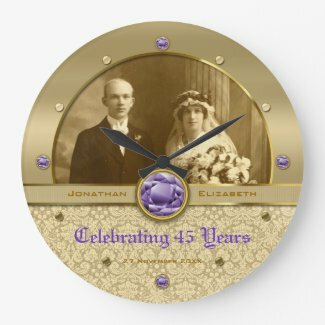 Makes a perfect Wedding Anniversary or other special occasion gift. One of the more popular item so far in this amethyst-and-gold series is the gel mousepad, shown above. 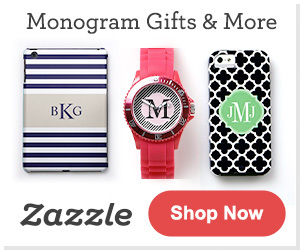 I think it’s a wonderful way to add a touch of luxury your desk! It’s not just gorgeous to look at, but also features and ergonomic wrist support and non-skid black plastic base. Vibrantly printed in full color, this dust and stain resistant mousepad will add a dose of elegance to your workspace. This luxurious, eye-catching binder makes a wonderful, commemorative photo album. Celebrating a wedding anniversary, or a fiftieth birthday? This set covers all your needs to evoke an elegant, classy party. There are also matching greeting cards and postcards available. This lovely Liquid Courage stainless steel flask is by far the most popular gift in this amethyst-and-gold series. I’m not surprised! A flask makes a wonderful wedding or party favor. 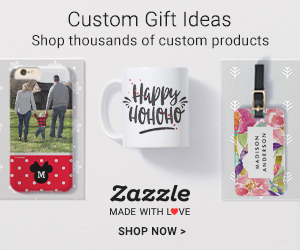 The design is professionally printed in vibrant color on high quality vinyl and permanently wrapped around the flask. Of course, it’s not just for holding liquor and spirits, so even those who don’t drink can use it for non-alcoholic beverages. Practical and beautiful at the same time! Here’s a clock design, with smaller gemstones going around a golden circle, for telling the time. 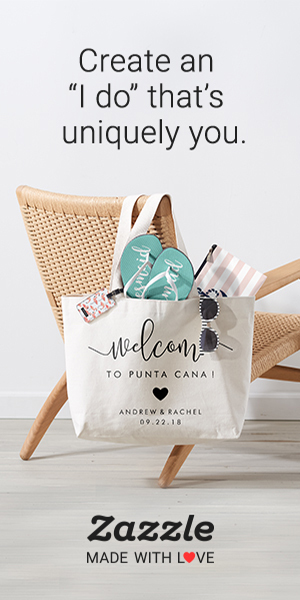 Replace the sample photo with your own. 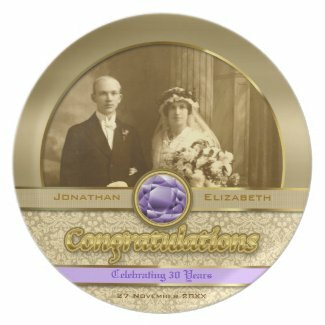 Finally, we have an anniversary display plate that serves as a customizable frame. It might be weird to use for dinner, but I’d display it on the mantle instead! 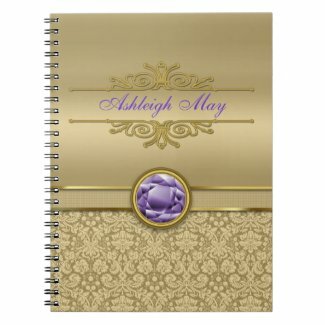 Click here to view all gifts carrying this amethyst, gold and damask design. 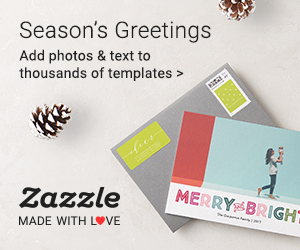 As always, if you need help customizing elements, resizing old photographs, or anything related to personalization, please don’t hesitate to contact me. I’d love to be of help! 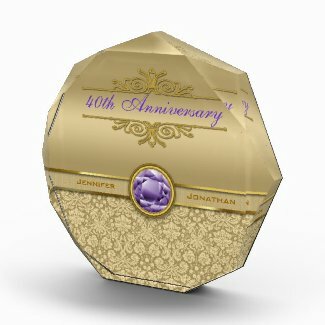 You just finished reading Wedding Anniversary Amethyst Gemstone with Gold Damask. Please consider leaving a comment! 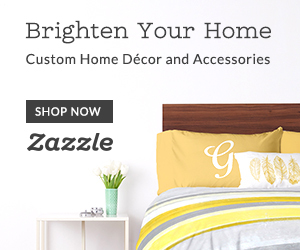 This post is from the interior furnishings website, Beverly Claire Interiors. If you are not currently reading this via interiors.beverlyclaire.com, then this post may have been stolen or scraped from the Beverly Claire Interiors site. Republishing this article in full or in part is a violation of Copyright Law (c)2010-2018, All rights reserved.